With a strong commitment to delivering superior quality services, AvantGarde Senior Living and Memory Care is a leading senior living community in Beverly Hills, CA. Our focus is on offering personalized senior living that evolves with residents and enhances their lifestyle and well-being. 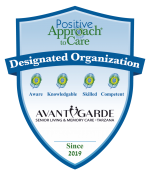 At AvantGarde, we make it a goal to go above and beyond to improve the lives of our residents. Our team of caring and passionate staff is there any time our residents need them. All our residents have different interests, hobbies and needs. That is why our staff provides customized solution that suits their specific requirements. AvantGarde takes pride in its modern, spacious and comfortable living spaces, which are equipped with several amenities. From time to time, we hold social events so that our residents get an opportunity to meet and connect with like-minded individuals and age with dignity and grace. At AvantGarde, we believe that successful relationships are built on trust, compassion and respect. Therefore, you can expect truly exceptional services from us. Our long-term goal is to build lasting relationships with our residents. In order to achieve this objective, we make sure each resident gets compassionate and dependable service, while maintaining their safety and privacy as well. We train our staff on how to best care for seniors. They use innovative techniques to help residents. Get in touch with us today to schedule a tour of our senior living facility.